The entire event is visible from North and South America, the eastern Pacific Ocean, and westernmost Europe. Much of the eclipse will be seen in central and eastern Europe, but observers there will miss the later stages of the eclipse because they occur after moonset. Likewise parts of the central Pacific experience moonrise after the eclipse begins. None of the eclipse is visible from Central and South Asia, nor Indonesia, Australia or New Zealand. There’s lots of hype circulating around this eclipse, as it assumes the meme of the “SuperBloodWolf Moon eclipse” in various spaces on the Internet. 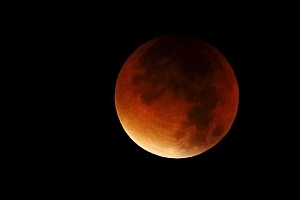 A lunar eclipse occurs when the Moon is near Full and enters the Earth’s shadow. With an orbit inclined 5.1 degrees relative to the ecliptic, the Moon “misses” the Earth’s shadow during most Full Moons … about two to three times a year, however, the intersection of the Moon’s orbit along the ecliptic (its ascending or descending node) falls near the dark inner umbra of the Earth’s shadow ringed by the bright outer penumbral shadow, and a lunar eclipse occurs. A lunar eclipse can either be a subtle penumbral, a partial eclipse just grazing the inner umbra, or, as we’re seeing this month, a total lunar eclipse, with the Moon fully immersed in the Earth’s dark umbra. A lunar eclipse is the shadow of the Moon moving across the surface of the Earth. The Full Moon is in Cancer, conjunct the North Node, Rahu. The Sun is 180° opposite in Capricorn, conjunct the South Node, Ketu. Mercury is also in Capricorn at the time of full moon, but is sandhi, depleted of energy. The Full Moon is in trine (5th house) aspect to Venus and Jupiter, who are nearly within degree conjunction, a very sweet and beneficial conjunction. The Full Moon also trines (9th house) Mars in Pisces, stepping through Revati, the final nakshatra in the twelve signs. Mars in Pisces experiences some diminution of its fire energy being oversighted – and aspected – by Jupiter in a water sign. This brings out the better side of Mars, inclined to beneficial aspect and distribution of energy related to compassionate, humanitarian and beneficial activities for the masses. This benign trine of Moon-Jupiter/Venus and Mars could also herald the end of government shutdown in the US. The other matter to be aware of is the “step” or “face to the world” that is signified by planets in Virgo in the Navamsha is “step (or pada) 3”, which is communications of all kinds. We note that communications will suffer slowdown, delay, speed-throttling, restrictions on carriage and delivery. Allow things to slow down, allow yourself time, bring your systematic common sense into things, and give your message out slowly, carefully. Additionally, this applies to social media as Saturn is karaka for computers. The umbral phases for the eclipse span over three hours in duration, and totality lasts just a second shy of 1 hour and 2 minutes long. 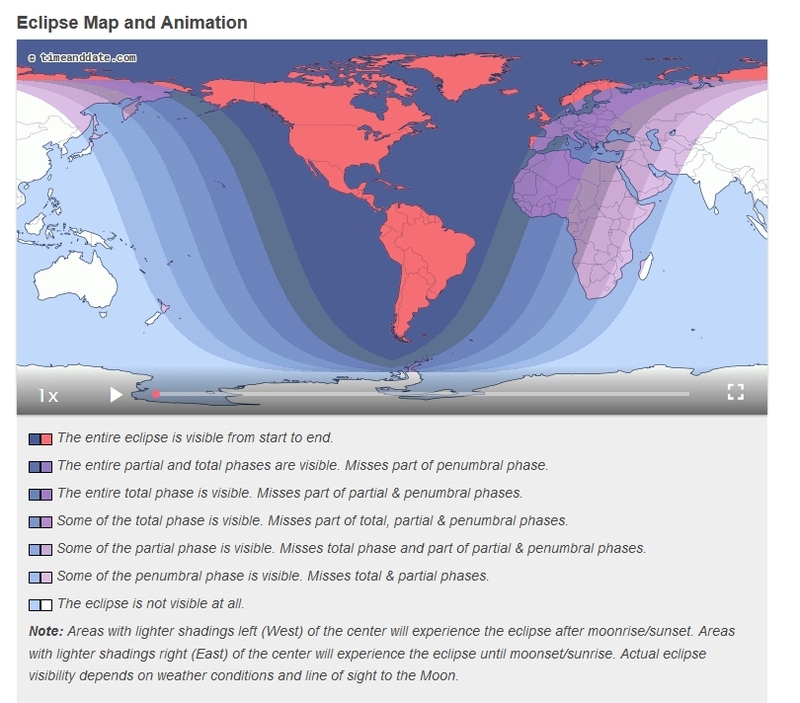 North and South America will see the eclipse in its entirety late in the evening, while western Europe and northwestern Africa will see the eclipse in progress at local sunrise and moonset. Hawaii and the western Pacific region will see the eclipse ongoing at Moonrise. We take a path through the midst of the Eclipse, looking to Havana, Cuba. Eclipse maximum time is 00:12:18, which gives a weak Virgo ascendant. This places Sun and Ketu in Capricorn, in the 5th house. Moon is in the 11th house, Cancer – its own sign – conjunct the North Node, Rahu. In its own sign, Moon needs nurturing, caretaking, protection and defence. Here, the mind seeks protection, custody, someone else to be the protector. Rahu, on the other hand, seeks social mobility through carefully defended home and base; home and base are simply a springboard for Rahu to ascend to higher heights, like the Smooth Operator of Sade’s song. Rahu simply makes Moon feel more abandoned, uncared, sans nurturance. Ascension is not about seeking higher heights, social mobility and position, climbing over kith and kin to reach one’s goals. Ascension is about integrating light bodies, leaving behind the contraints of older times, power and pelf, and living one’s true heritage as a child of the Cosmos, Oneness with all that is. There are many ways to describe Ascension, which is now the open moment, and an everywhen, when people commence living their true birthright. The social mobility of Rahu has nothing, nothing to do with Ascension. The nurturing, caretaking, protection and defence that the Moon/Mind needs are the stepping stones of birthing the Golden Age within: we actually need to do this for ourselves. If we do not defend, protect, nurture and tend to our souls and soul growth, then we are being untrue to our true selves. The Vedas proclaim: Sathyam Moolam Jagat, truth is the basis of the Universe! In Ascension we are being called to touch base with the truth of who we are: we are all cosmic consciousness in a human body seeking to know itself. This eclipse is a call, a reminder to be true to ourselves and to get back onto the path of our soul journey in the human form. We are human beings having a spiritual experience. This is the message reinforced by totality in this Eclipse: taking place in the 11th house, the house of interaction with our peers, our community, our bonds with each and every other human being in our world. Ascension also takes place in the marketplace, social systems, networks, community, assemblies, ecologies, achievements, and in the ways we access our sources of revenue. 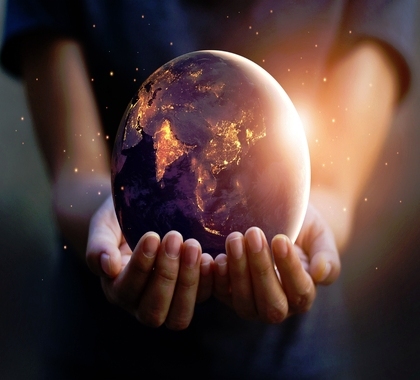 Moon in 11th house evokes the emotional connections to Mother, and in this instance, connections to the Earth our Mother, Bhudevi, and how our neglect and damage has given rise to ecological crisis and climate change events. The affliction of Rahu to Moon in 11 house gives evidence to the disbelief and malefic elements in a wider network of community relationships who abuse the Earth our Mother and proclaim that Climate Change is a myth, a fabulous tale, and does not exist. The results are that nations may seem frozen, or scientifically detached in the relationship to the Earth and to the outcomes of the Paris Agreement in the United Nations Framework Convention on Climate Change. The challenge of this eclipse is to be appropriately sensitive to economies, networks, the agreed targets of COP 24, and perceived community bonds in attaining this all-important target, for the welfare of all humanity, and the welfare of the Earth herself. Nurturing, caretaking, protecting and defending the Earth our Mother is needed at this time.